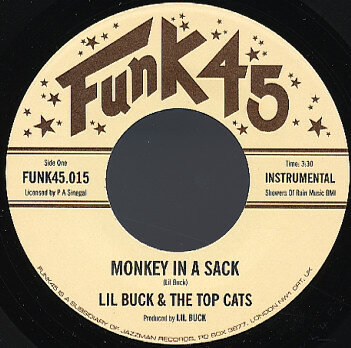 Listen to Lil Buck and the Topcats on Monkey in a Sack and Cat Scream. Perhaps you don't recognize the name Little Buck and the Topcats, but when this fraternity of South Louisiana R&B men hit the stage together for the first time since their reigning teenage years, suffice to say, you'll more than recognize them. Bandleader Little Buck Sinegal played guitar with Clifton Chenier for years and is one of greatest axe-slingers on the blues scene today. Drummer Nat Jolivette provided the beat for everyone from Little Bob and the Lollipops to Rockin' Dopsie. And then there's Hammond B-3 organ maestro Buckwheat Zydeco—better known nowadays as one of South Louisiana's top accordion players—and vocalist James Alexander, he of the La Louisianne Records soul classic "You've Got The Power." And speaking of wailin' discs, collectively, this is the band responsible for the impossibly great, funky as all hell "Cat Scream" b/w "Monkey In A Sack," (also originally released on La Louisianne), which has lately been making all kinds of waves with funk, soul and hip-hop DJs the world over. Get ready for another Mau-Mau special; for the first time in nearly forty years, Little Buck and the Topcats! !